I just wanted to let you know about my memory mosaic. It came about from a small commission for a wedding. My client wanted a mosaic and some flowers and the date to remember and mark the special day of her daughter's wedding. So this got me thinking that firstly I could make a memory mosaic to mark ANY special day - birthdays, anniversaries, all sorts of occasions, as well as weddings; and secondly, how about making the flowers completely bespoke?! So for a wedding, the bride's bouquet, and for other anniversaries, maybe a favourite flower or group of flowers. I thought I would give the option of date at the bottom or not, make it suitable for outdoors and in, and keep it to an affordable price so that a group could club together for it, or as an individual's personal gift. With all these thoughts in mind, a list of all the flowers in the bride's bouquet and a photo of one similar I got to work, feeling very excited! I used 30cm x 20cm exterior plywood and measured out the sizing and spacing on it. Then with my list of flowers and Google images I got started! It is really important to me to make the flowers look as realistic as possible! Lysianthus and delphiniums to start with - this is where my broad selection of carefully collected tiles come into their own! Next came the three lilac roses, fronds of veronica, and the very tricky white freesias! Finally, for the bouquet, some stems and matching ribbons. 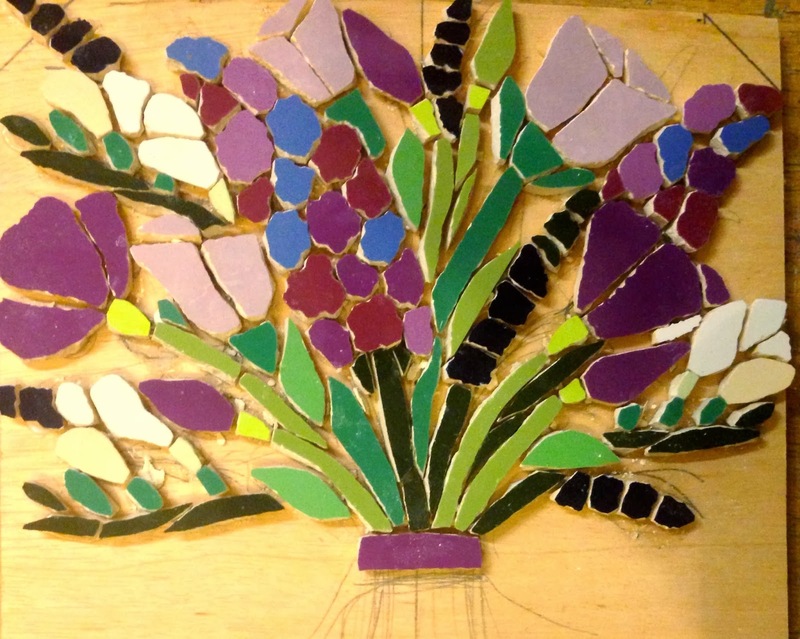 I so enjoyed making it - challenging myself to mosaic new flowers, but trying to keep to the spirit of the wedding bouquet. I gave it a good coat of looking - wondering if I should add eucalyptus foliage, or bright green leaves ... but no - enough! I am happy with it as it is. A muted background of pale yellow in the thinner tiles, so as not to detract from the flowers and the date, and now I am ready for grouting! A mushroom brown is the best tint to bring all the colours out. And here it is, finished - phew! What do you think?! the colours of the different flowers are vibrant.. It's been a lovely commission, and I hope to make many more in future for all sorts of different occasions and celebrations! Do leave me a comment - my heart and soul went into this!! As you can imagine, I spend quite a bit of time snipping in my studio, and there are a variety of things I like to listen to, depending on my mood. Just thought I'd share them with you. I guess my default setting for listening is music - this can be anything, but generally classical in the morning and something more up beat in the afternoon to keep my energy going. I have made playlists over the years so have lots to choose from and I am always adding to them. I also listen to talking books. At the moment I am enjoying my daughter's David Walliams' books CDs, with him reading them - fab! And finally, of course there is SILENCE.....ah! I love that feeling of freshness and new possibilities at the beginning of the year. Some are glad to leave the old one behind, others can't wait for the opportunities the new one offers! For me, resolutions are not brilliant - I'm bound to break them! But I have hopes and plans - one of my hopes is that I stick to them!! I won't bore you with my personal ones - probably the same as a lot of yours - maybe THIS year I can achieve them - we'll see ...! Workwise, I am starting the year running with an order for 18 of my smaller mosaics for a gallery in Wales - amazing that they are showing such faith in me and buying them outright - not full price, of course, but the boost it gives me and my business is priceless! I read other people's blogs and enjoy the freedom and honesty with which they write - I think I am too ... careful and I don't think you get to know me really ..- if you want to that is! When I first thought about starting a blog, a 'friend' said to me, "..but who would want to read it, Felis?!" - I know, supportive! But according to my stats, I have 75 faithful followers and an average of 30 views a day, so THANK YOU! I would love you to leave me comments so I could get to know you a little better too- even if it is "blogknow'! It can get a bit lonely being an artist sometimes, so to hear from you would be lovely, and know there IS someone out there! I launched my Valentine Showcase on my Folksy shop today if you fancy a look - https://beta.folksy.com/shops/felicityball/collections/106031 - just to say, please order by the end of Jan and a bit earlier for ROW to receive them in time. Here is a taster.. So, thank you for following me and sharing my mosaics and my mosaic journey, and I look forward to hearing from you.